Craft ideas are of many types that both adults and kids can try at their home for coming up with the most astonishing output. We can make use of different materials such as colourful papers, leftover decorative cloth, decorative ribbons, threads and some of the trashes that are of no use for us, anymore. Jump start your day from trash to treasure by making use of these used Tuna fish cans. 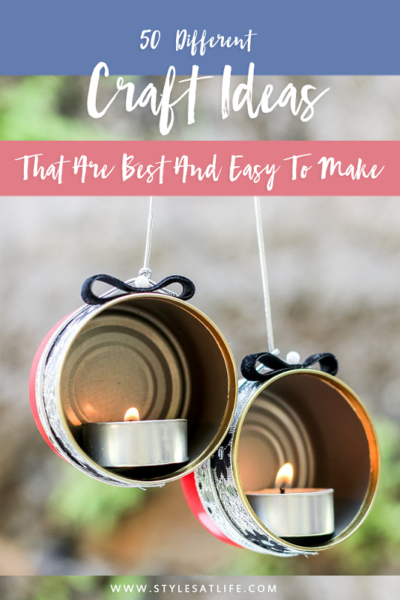 Instead of putting it into trash, we can make use of these cans into marvellous craft of candle holders, as shown in the link. 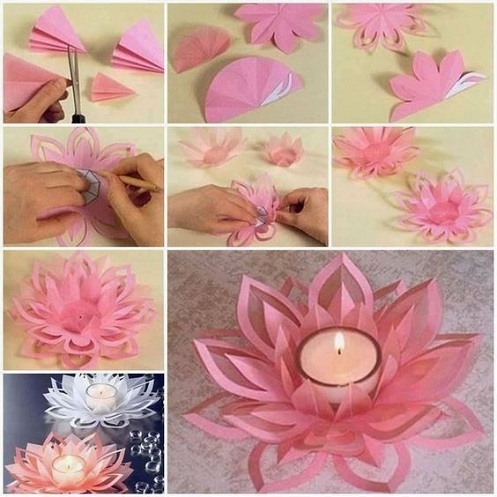 Anyone can try this, since it’s a simple craft idea. You can use them on any occasions or any special functions too. Plaster of Paris is not only used for any household or construction repairs, but also for a beautiful and chic home decor. 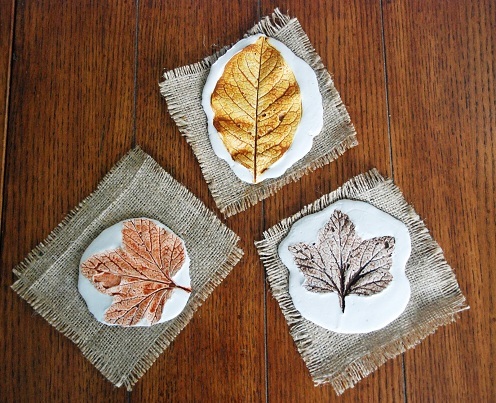 Yes, we can come out with a new idea of a beautiful leaf print that can be laid over the Plaster of Paris as mentioned in the image above. Enhance your imagination of ideas to use these magazines into useful Tea coasters without putting it into the trash. 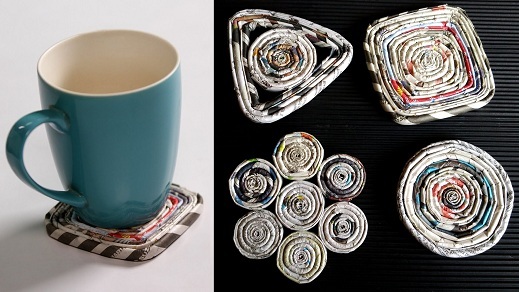 The link shows a step by step procedure of making smashing easy craft idea of Tea coasters from your used magazines.If your guests come to your home frequently than this one crafts are essential always. 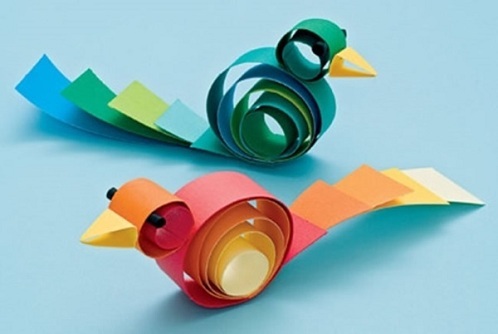 This could be one of the simplest and easy craft evolved from used old books, ever imagined. 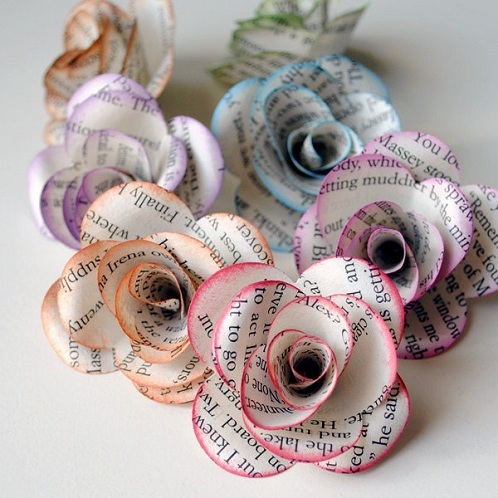 Don’t hesitate to try these paper flowers, which could be the most exotic ones, made from your old leftover used books. 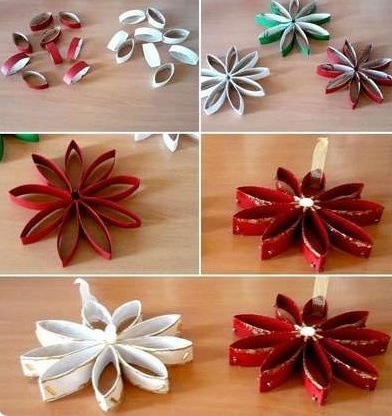 If you want to save papers and if you have idea about crafts then making paper flowers will be good idea and you can gift this craft to your dear one or friends too. This one will be good showpiece always. Never ever throw your used plastic spoons and forks, but clean it once and preserve it. When it increases in numbers, you can make use of these things into a tremendous and dashing craft as shown in the image. 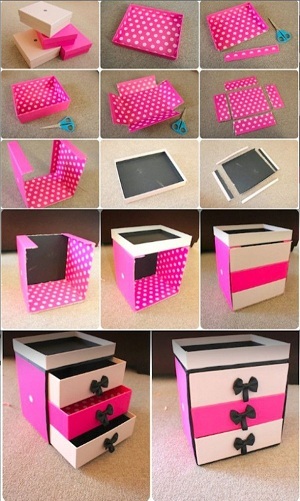 If you want to make something different and useful then try this craft idea and get it done as soon as possible. 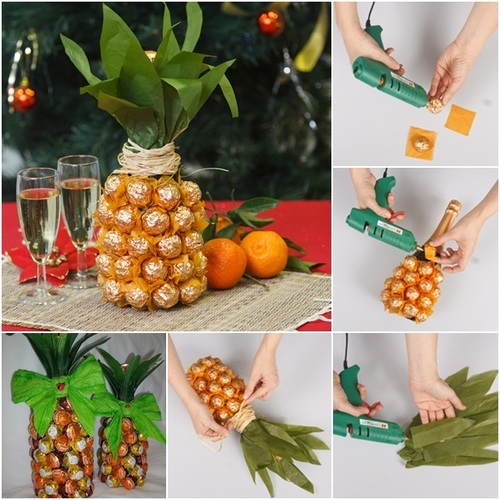 Here, it’s not a trash or something, but both chocolates and wine bottle, is used in an elegant manner. There is a step by step procedure to try it by yourselves and thus excite your beloved ones by gifting them this simple craft. You can use Cadburys too and gift this type of craft to birthday boy. 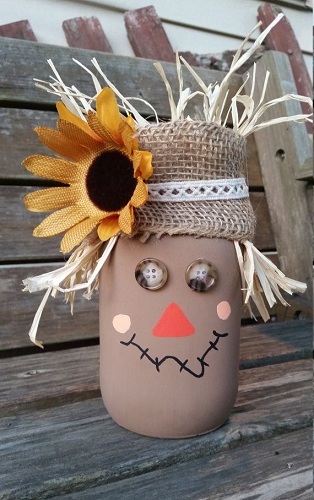 Here is the best thanksgiving and easy craft design ideas for kids. It’s a painted glass candle holder, which can be painted using any desired shades of any imaginable design. Yellow colour dots give catchy look to glass. Small functions time you can utilize them or you can plan for candle light home dinner with your husband that time this one will be good choice always. Discover this unique imagination of button bowl crafts which must be the most distinctive craft design ever evolved. Colourful buttons are just stuck on the glass bowl, which can then be used for any purposes including presentation. You can use fibre glass too instead of bowl, it depends on your creativity but this one will be good idea for decoration. 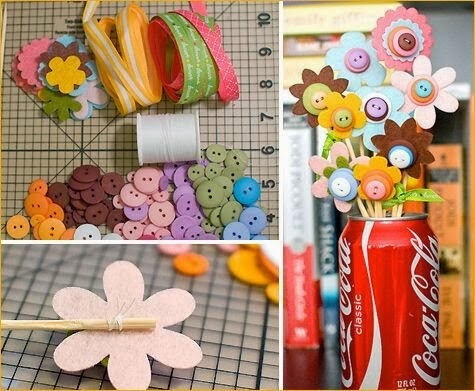 Use coke can as a base for the flower arrangement made from colourful ribbons and buttons. Try this unique collection of flower arrangement idea, which would definitely steal the show and make you glad. Such type of crafts gives good look to your showroom or your cupboard, get this handmade craft or make your own flower craft to gift someone. 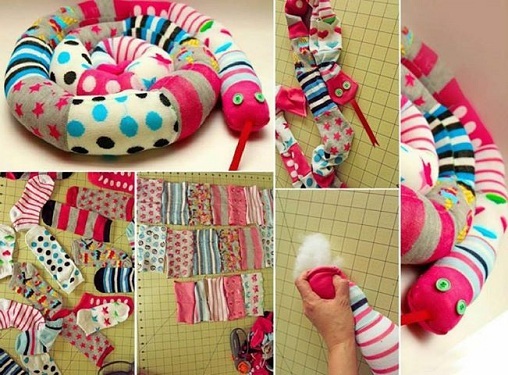 Uncover this artistic imagination of making a colourful snake by using those old colourful kids’ socks, which are not in use now. This would be the different craft ideas, which can ever strike in one, have thought. Gift this craft to your kids; they will surely enjoy this fun making crafts. 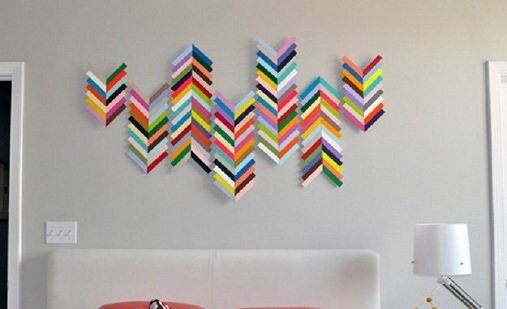 Why not try this self made home decor which can be wall hung in any of the rooms of the home? It is made up of cardboard, wrapped with a printed gift wraps and then colourful buttons are stuck on it. 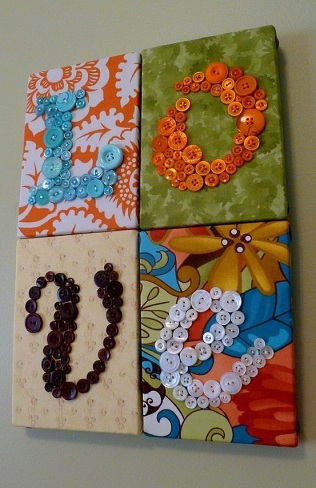 This one will be good idea to make a craft using recycled stuff, using different colour buttons you can make a good quote on canvas board. 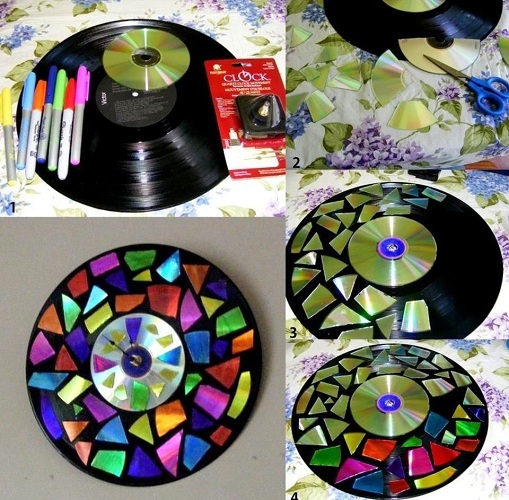 Gift this to your loved one he or she will surely appreciate this craft idea. 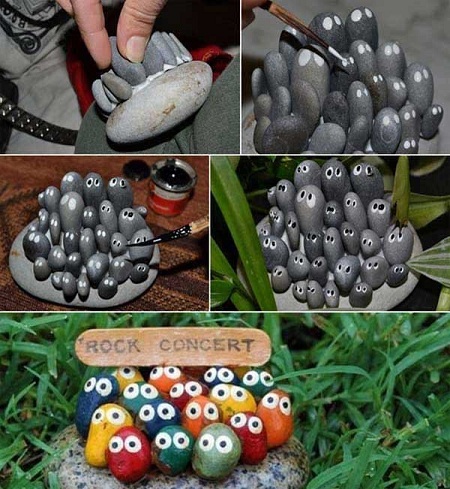 Make your day by choosing this kind of simple craft ideas. It uses only different colour papers and a stick to hold the flower. Develop your imagination with your own sensational design. 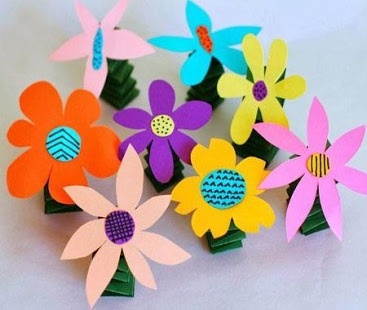 When you will do this craft that time let your kids know about how to make this type of paper flower craft, kids love creativity and they will surely help you too. 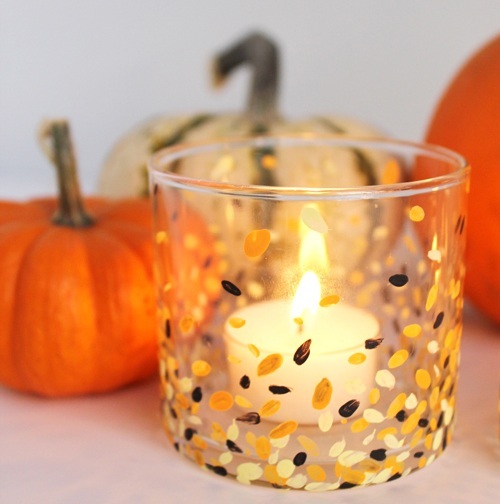 There are millions of ways to decorate a candle holder. This unique candle holder of paper flower base is kept as a centre piece on the table, which makes a perfect and amazing candle light dinner. This one is advanced type flower craft, many women’s like to sell this type of handmade crafts. It’s one of the best craft ideabes in which the used socks are transformed into a marvellous bunny. Complete tutorial is given in the link, to make this cute sock Bunny as a wonderful kid’s soft toy. Surprise and make a smile on your baby’s face with the help of this craft idea. This one mostly preferred by women’s. 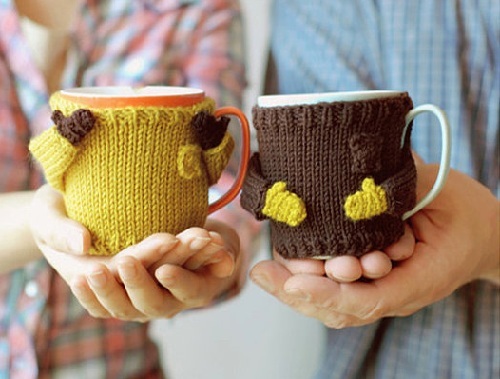 Intensify your ideas by choosing this fantabulous and awesome coffee mug cover craft ideas, which are the most creative ones. It must be the best self-madegifts that can be given to your near and dear ones. If your loved one like to take coffee regular then this one will be good for him or her. 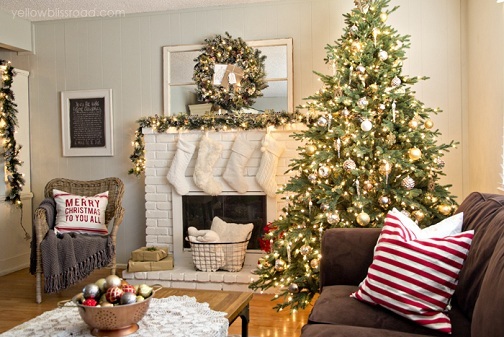 Stumble on this amazing and stunning Christmas decorating craft ideas. These beautiful craft ideas of cute whimsical table top trees are the perfect holiday decorations during Christmas season. Gift this one Christmas craft to your friend on his upcoming Christmas season. If you actually want to go with an easy craft idea, then opt for these kinds of a crafts which can be used in the special occasion in our home as hanging felts. 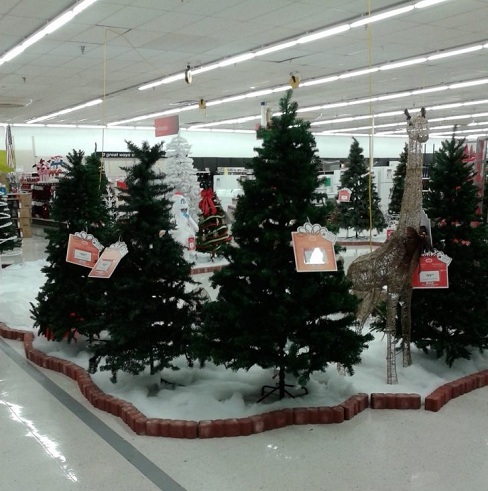 We would be very glad and settled that we made our own party decors. 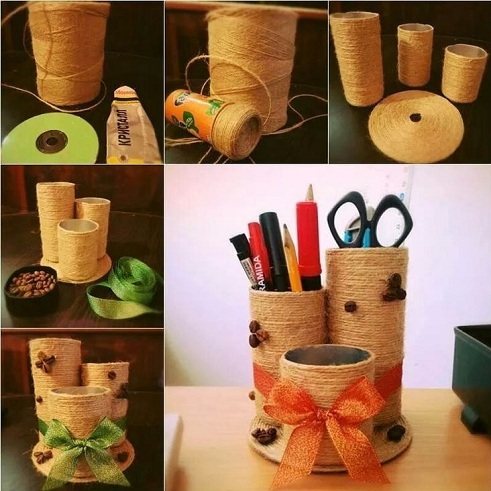 Here is the unique kind of pencil holder craft which is made up of jute thread. 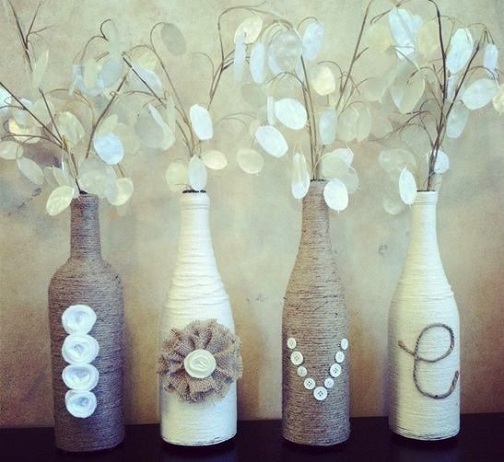 Thus craft makes use of simple materials such as disc, jute thread, glue and used cans that maybe of cardboard. The entire stationary of our kids can be made set in it. Kids can gift this to their parents. 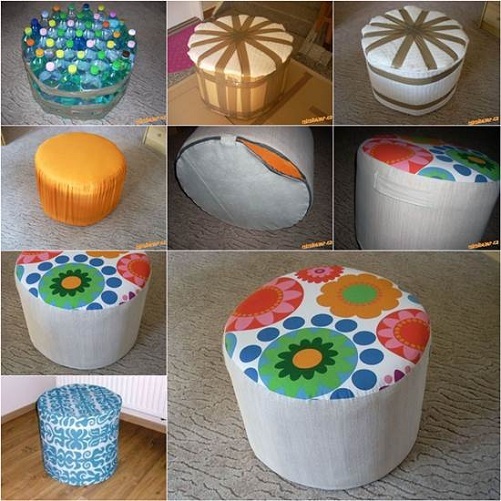 Here is the best craft idea that makes use of the set of used plastic bottles into crafts, to make an enchanting Ottoman. Thus, the worst trash of environment is transformed into a beautiful Ottoman which is one of the best household items in use. Many of us opt for decorating our modern kitchen with some wooden hangings. In that case, we can go with this simplest kitchen wooden decor, which needs the minimum and cheapest materials. This one will be fun sure. Here comes the fantastic and illuminating candle holder which literally needs only two things- a waste glass jar and dried leaves. 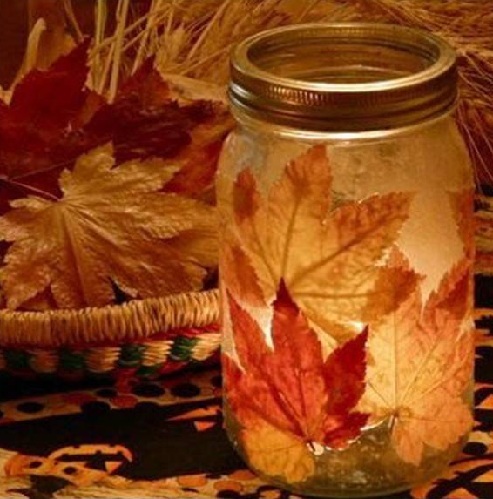 The only thing is, the leaves should be stuck outside the glass jar where as the candle should be placed inside it. 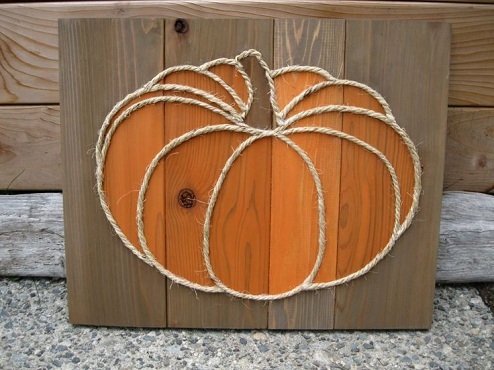 When it is the case that autumn is peeping besides us, we can go with these kinds of authentic yet simple craft ideas which best suits the autumn season. This is a floral wreath which is made up of glittery and shiny colour papers with a bow headed over it. 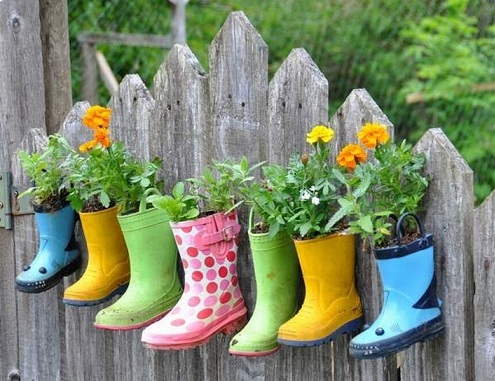 Here comes the perfect of all the crafts that can be best suited as a garden decor. This is a new craft idea which is meant for adults and it sets its surroundings to be trendy and glorious. If you want to make your kids happy and glad at the moment, you can make them to opt this kind of crafts. These easy crafts make minimal usages of materials. Kids really enjoy doing it and at the same time, they feel proud that they have done their own inventories. This could be the most fresh and new craft ideas of all the kids those who are really enthusiastic about making such kind of new things. 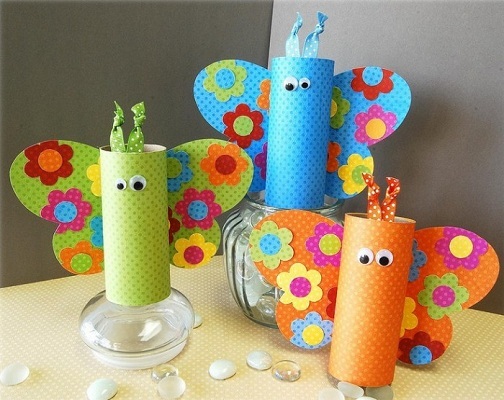 Adults can help a bit, in collecting materials for this particular craft and make their kids complete the gorgeous look of these colourful butterfly crafts. 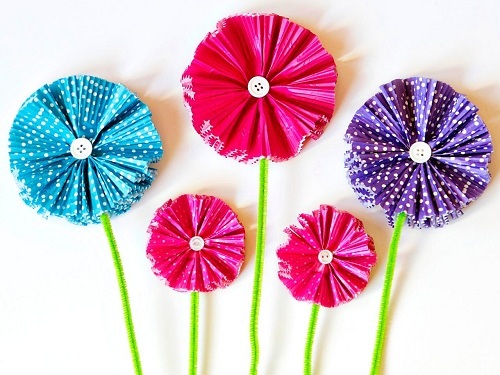 Establish this simple DIY craft for kids which are very convenient in crafting. It is just making use of woolen colour threads, few feathers and some beads along with the circle shaped thing as shown in the link. 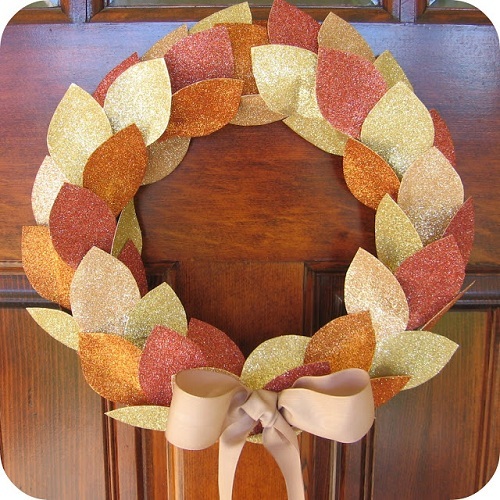 It is used as a door hanging decor. 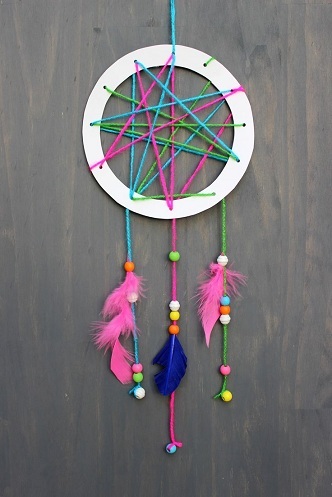 Try these dreamy yet cool simple craft ideas for toddlers as their academic projects. 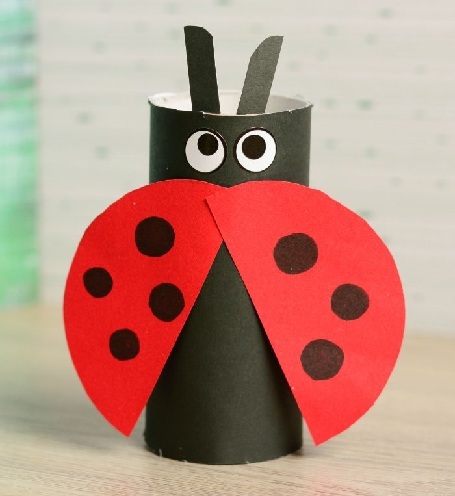 It’s a stunning imaginary ladybug made up of used toilet paper roll. 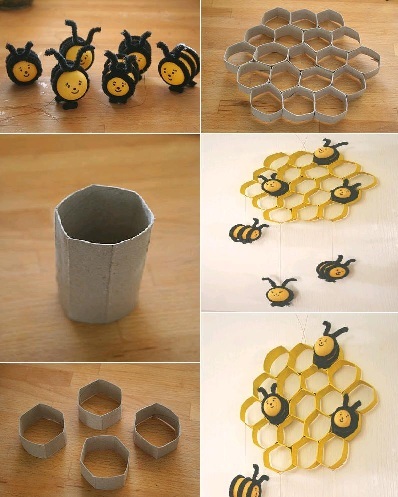 This one is good idea to make a craft in simple way. 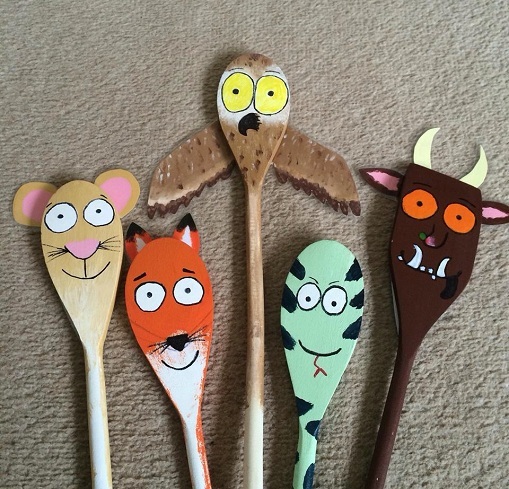 Story spoons are another set of kid’s collection of crafts. 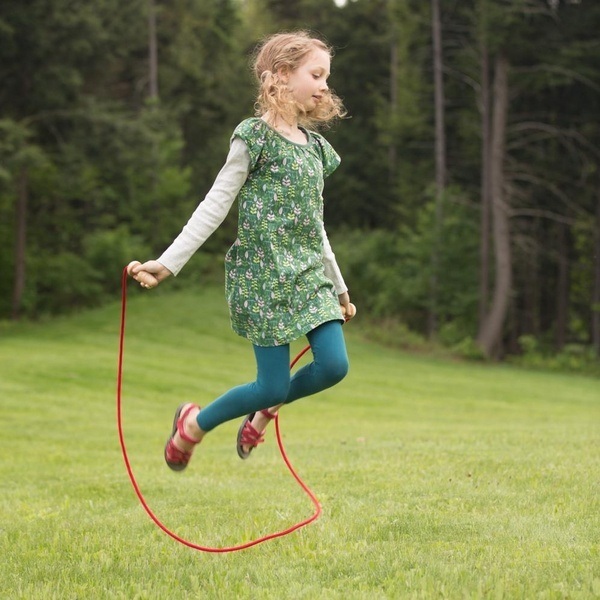 It’s entirely flabby and new craft ideas for kids. It makes use of only wooden ladles that are available in all of our kitchens. And some enamel paints, so that it gives a glossy look on its paintings. If you want to dress up your garden with a contemporary and best craft idea, then go with the kind of one, which is shown in the image link. It is as cheap as it is convenient to make, and there is no doubt that it makes the garden glorious. Instead of putting it into the trash can, the eggs tray can be used for making such a kind of stunning craft ideas. 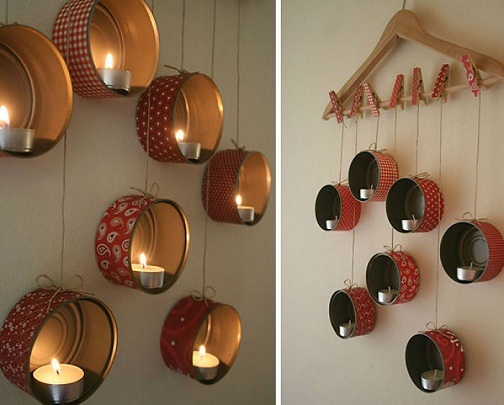 It makes use of inexpensive material but it gives the classy look when it turns into a home decor. Discover these latest craft ideas of paper wall art which makes it the most sensational DIY home decor. 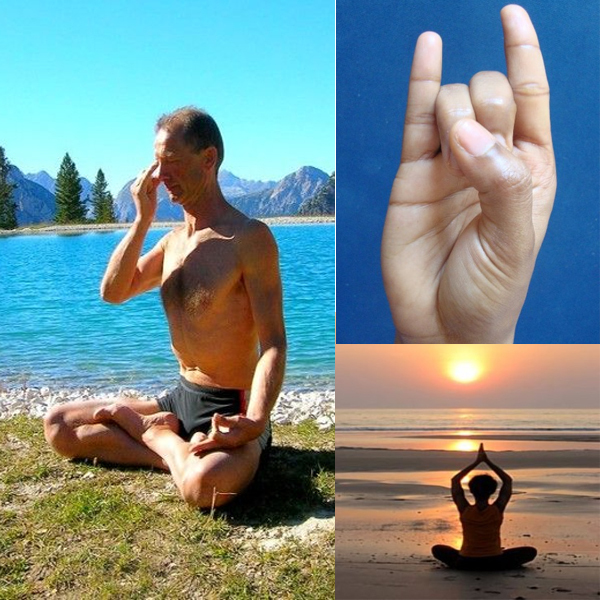 The entire tutorial is given in the link, so that it makes it easy to follow the steps one by one. 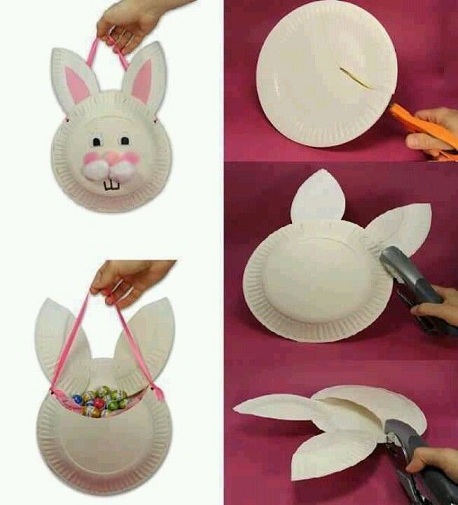 Own this rabbit Easter basket which makes use of simple paper plate and only few crafting accessories to fill the details in it. It can be either gifted or owned as a home decor during the festive season of Christmas. 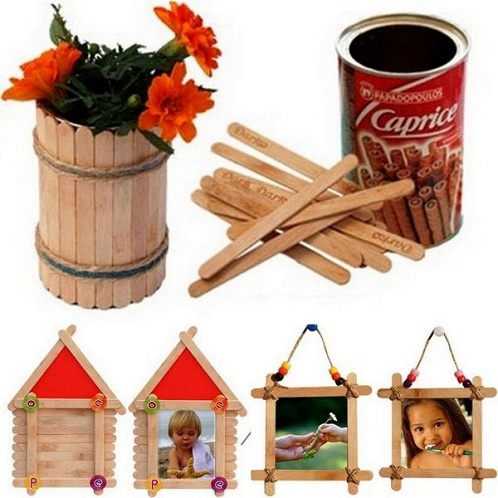 If you literally want your own inventory home designs, then you can go opting this kind of crafts which makes uses of Popsicle sticks. There are different craft ideas making use of this sticks, among which, two of them are displayed in the image. Have fun and enjoy making your own discoveries. 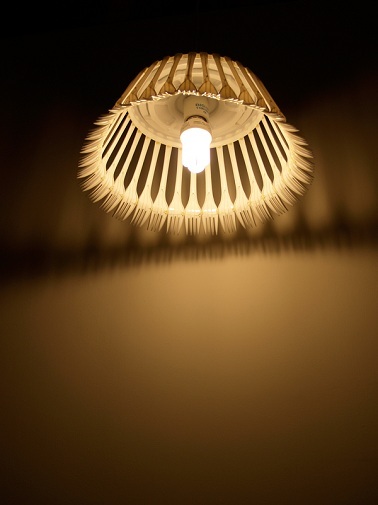 Some craft ideas make use of the trashes as raw materials, as the one described in the above link. Here, the used wine bottles are again reused for the craft of such kind. The final product looks really gorgeous and trendy as delectable home decor. This particular project is entirely of extreme use in all households. It is a stack of drawers, which can have multiple usages. It is made up of thick cardboard wrapped with crafted papers and required a small handle to pull the drawers. Instead of burying them under the soil and polluting our mother earth, we can just do a bit from our side to save it. Hence we can collect this trash Coke cans and make crafts as shown in the image in order to use it as a utility product for our home. It can also serve as a designer showpiece being the latest craft idea. Step by step procedure of making this unique new craft idea is being described here. A balloon is inflated to desired size and then the rigid thread is been rotated over it continuously till the balloon is totally covered. As a final stage, the balloon is the deflated and we get this new fantastic home decor. Make use of this sublime and terrific idea of making rose arts as patterned in the link. In this particular craft, we can either choose the same colour of roses or we can also opt for different colour roses to be engraved on the base. This unique craft idea is meant for adults, since it has a bit tough procedure to compete with. The spoons should be cut and pasted accordingly around the mirror as shown in the image. Then the spoons are spraying coloured with designer pattern to get the final tremendous and mind blowing home decor. This versatile art of paper quilling is loved by most of us. We don’t need extra effort or any costly materials to use, but just a little patience and our precious time. 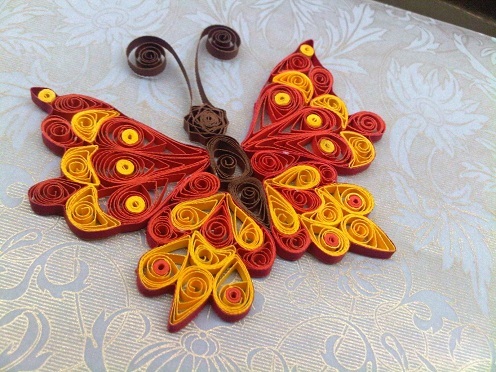 Kids of all ages have keen interest to make such kind of a paper quilling crafts. If you want to gift your wife then this one handmade glass jar craft idea will be yours. 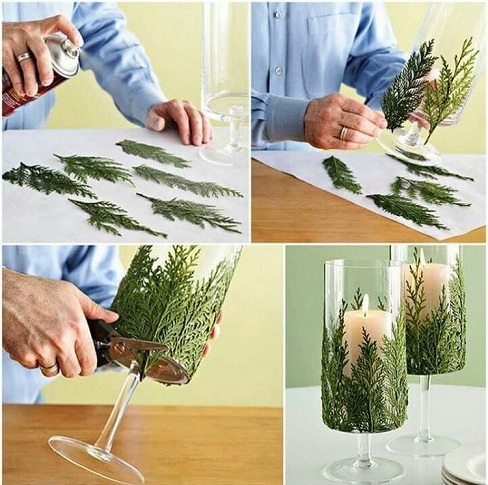 Here, leaves of the Christmas tree is made used to stick on the glass jar, to get that unique look. This glass jar can either be used as a candle holder or as a plant holder. Here comes another collection of jute basket that can be used either to store fruits or vegetables on table top. It is very trendy and stylish as well as very convenient to make up. Nowadays, Designer clocks cannot be owned with less than an amount of thousand bucks. If you desire to have a piece of designer wall clock, which is inexpensive too, then you could opt this kind of craft design. Study the step by step procedure given in the link and then follow the same to complete your lavishing wall clock. Stack colourful papers one by one and cut into desired shape such as hearts, floral and many others. Then tie one by one as shown in the image to form a row. Finally, try fixing it to the base that is attached to the wall. 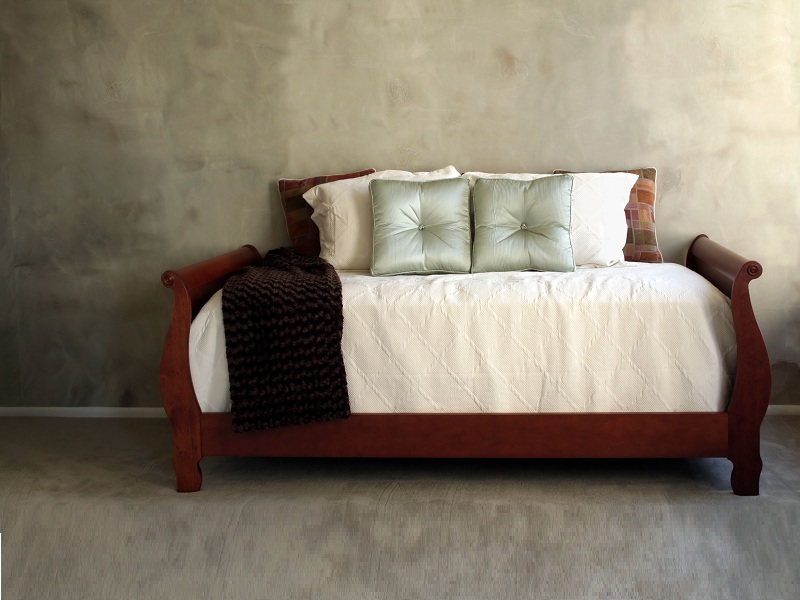 Here are your trendy and latest craft ideas for your bedroom. 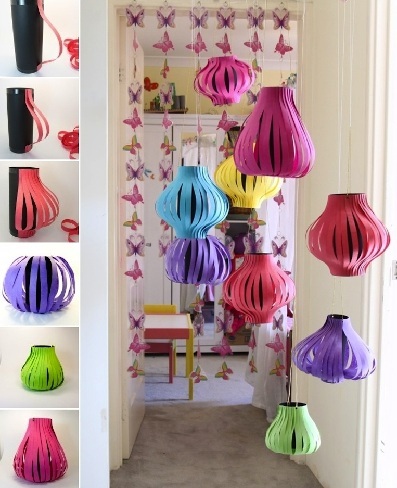 Lanterns made up of colourful papers are now trendy and gives a fabulous look to our home. They are so effortless and convenient to make, that they are tried by kids too. 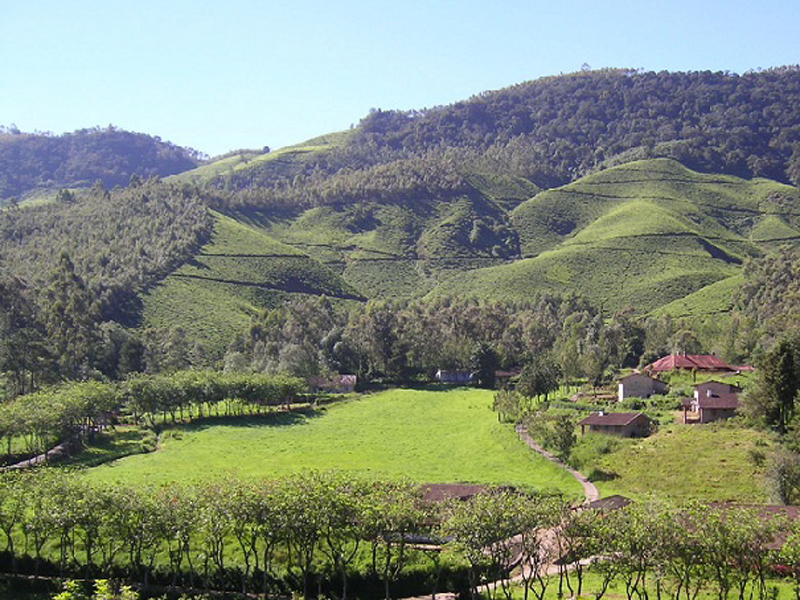 Some people also like to enhance the beauty of the garden and hence go for ultimate Garden decor ideas. Here is the kind of one, which can be undoubtedly used to decorate your garden. The raw materials used here are the items that go for the trash so no need to worry about the fund. 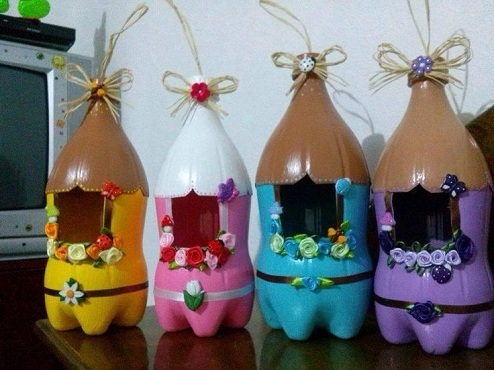 Kids would enjoy doing such kind of latest craft design ideas. The walls of our home which are kept idle and plain now can be used to showcase such kind of homemade decors. 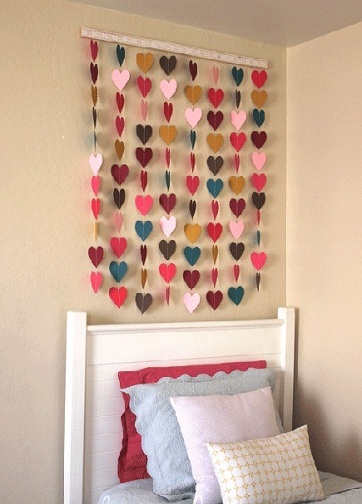 This kind of crafts would best suit the kids’ room. Cupcake liners are the typical suitable material that is used in most of the crafts of such kind shown in the link. The colours chosen for the liners, reveals entirely how the flower is going to gloom. The final product would be classy and fantastic. 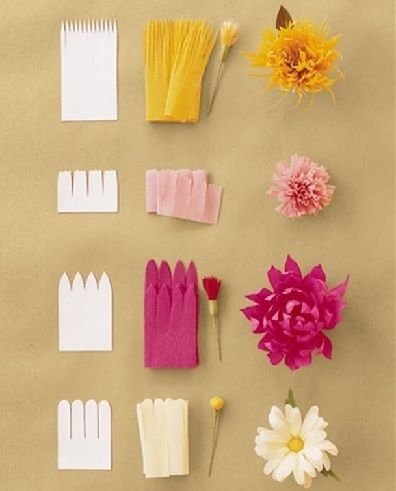 Paper flowers are the best craft ideas for the kids to enjoy their summer vacations or any other holidays. These kinds of craft activities make them sit in a place and let them think to their ability. It would make us know about their artistic ideas. 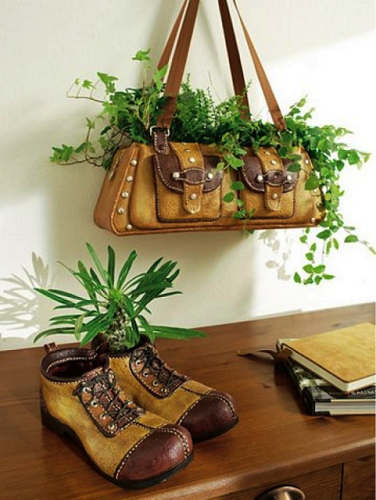 These kind of used leather handbags and boots are not necessarily be thrown into the trash. So make use of such renowned materials to convert them into an ethnic home decor as shown in the link. Make your day, by trying one of the craft ideas mentioned above to make and feel ourselves glad. And also make others happy by giving them opportunities to try these skills with your help and decorate your homes.